Artist, naturalist, and author Stephen C. Quinn has spent a lifetime exploring the natural world and working in a career at the intersection of art and science. Quinn joined the staff of the American Museum of Natural History in 1974, after graduating from the Ridgewood School of Art and Design, where he apprenticed under such diorama-art masters as Raymond deLucia, Robert Kane, and David J. Schwendeman. His first assignment was as a foreground artist for the Wood Stork diorama in the Hall of North American Birds. In his current capacity as Senior Project Manager for Exhibitions at the museum, he oversees all aspects of new diorama creation including field expeditions, exhibit fabrication, and installation, as well as diorama conservation and restoration. 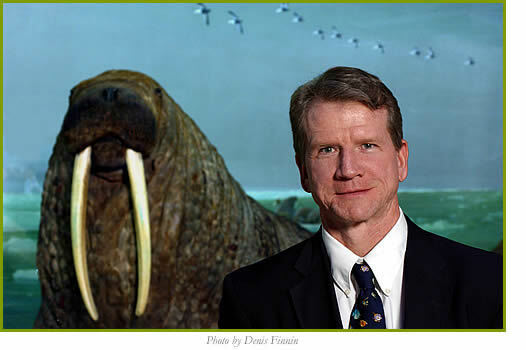 He was a project leader for the 1995 field expedition to the Central African Republic, which resulted in the rain forest diorama in the museum’s Hall of Biodiversity and was a project manager for the 2003 renovation of the Milstein Hall of Ocean Life. Mr. Quinn provided the illustrations for the 1994 book What Color is That Dinosaur? by Lowell Dingus, and was co-author of Inside the Dzanga-Sangha Rain Forest (1998) and author of Windows on Nature: The Great Habitat Dioramas of the American Museum of Natural History (2006). He has been a member of the Society of Animal Artists since 1978 and a member of Artists for Conservation since its founding. He lives in Ridgefield Park, New Jersey with his wife Linda and their two children, Tom and Claire. As a child, some of his earliest memories are of being surrounded by birds – the captive mallards, wood ducks, widgeon, canvasback, bobwhite quail that his older brother propagated as ornamental fowl. Also, inspired by his older brother's and father's artistic inclinations, Quinn drew what he loved. His childhood was an idyllic Tom Sawyer-like experience as he grew up exploring the vast wetlands near his New Jersey home. During his adolescence, when tracts of these marshes were drained and used as garbage dumps, he was deeply affected by what he perceived as a tragic loss of great value. The region, known as the Hackensack Meadowlands, is the subject of a book written by his brother artist and naturalist John R. Quinn – Fields of Sun and Grass by Rutgers Press. In it the older Quinn chronicles his younger brothers experiences exploring the marshes. As a youngster, while in Boys Scouts, he realized his gift when his fellow scouts admired his outdoor skills and marveled at his ability to imitate birdcalls and identify animal tracks and sign. To this day, the grown scouts from his scouting days and their scoutmaster recall a snowy moonlit night on a camping trip when Quinn magically called in four Barred Owls from great distance to perch above his troop for a close look in the fire light. As his attention diverted from birds to girls, Quinn would conceal his binoculars under his jacket while hiking to and from his birding destinations to avoid being labeled a nature-nerd. But he could not stop. On one first date he abandoned the girl in his car to chase a wild turkey (his first) that had crossed the road in front of them. That first date was his last – with that girl. While in high school he volunteered during his summers in the Exhibition Department at the Academy of Natural Sciences, where his older brother worked. This may have been the experience that charted his future. During his senior year of high school, after earning an A+ on an Advanced Biology term paper on birds of prey that he illustrated with pen and ink drawings, his teacher encouraged him to pursue a career as a scientific illustrator. After finishing two years as a Biology major at Delaware Valley College of Science and Agriculture, Quinn transferred to the Ridgewood School of Art and Design, where, though he excelled in all his classes, he was criticized for painting, drawing, and sculpting birds, which were considered suitable subjects for illustration, but not fine art. Quinn worked his way through art school while designing exhibits at two New Jersey nature centers. By his senior year, his portfolio was largely composed of natural history subjects and wildlife art. 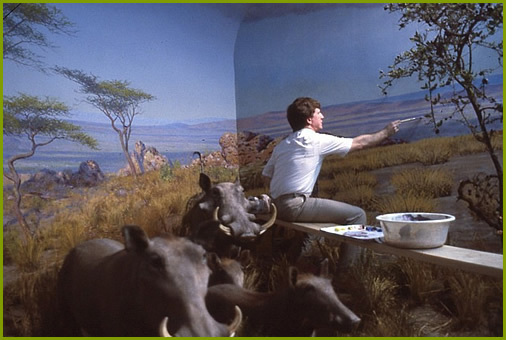 After graduation, when he applied for work at the American Museum of Natural History in 1974, he was immediately awarded a one year New York State Council on the Arts grant to study as an apprentice with the senior artists who were then about to retire and take with them the unique arts related to dioramas and natural history exhibit-making. After spending a year on the grant, Quinn was offered a permanent post on the art staff and has been with the museum ever since. He has worked to maintain the strong art traditions in the unique museum arts by training younger artists and sharing with them what the older masters had so generously taught him. In 1976 Quinn was awarded a second grant through the museum’s Warburg Scholarship Fund to study painting with famed wildlife artist Donald R. Eckelberry at the Asa Wright Nature Centre in Trinidad, in the West Indies. It was through that initial training session that Quinn developed a life-long friendship with Eckelberry who was an always-encouraging mentor and critic for Quinn’s paintings. Eckelberry nominated Quinn for a post on the Board of Managers for the Asa Wright Nature Centre, where Quinn spent a few years advising on environmental education programming focused on tropical rainforest ecology and working as a leader/instructor for the centres seminars on tropical ornithology and nature painting. For Quinn, the unique arts involved in the creation of habitat dioramas have always held his fascination. Over the years, his interest in field collecting, preparing specimens, taxidermy, foreground habitat fabrication, and background painting gave Quinn the focus to gather the data and archival history on the subject and eventually publish Windows on Nature: The Great Habitat Dioramas of the American Museum of Natural History (2006) - the most definitive book ever published on the museum’s world-renowned dioramas. In it Quinn guides readers through the museum for a dazzling look at nature, science, and art. This richly illustrated volume features vibrantly detailed full-color photographs of more than forty dioramas, rare and never-before-seen historical images from the museum's archives, and informative, entertaining descriptions of each diorama and its creation. Quinn's behind-the-scenes tour of these three-dimensional marvels introduces us to an extraordinary group of explorers, naturalists, painters, sculptors, taxidermists, and conservationists whose brilliance, passion, and eccentricities illuminate their creations. This unique showcase offers an exclusive look at the fascinating and sometimes mind-boggling techniques of diorama making, the development of dioramas as an art form and as a tool for wildlife conservation, and the museum's preeminent role in the history of art in the service of science.